Melissa plus Vivienne Westwood equals shoe heaven for mini fashionistas! Little girls love to mimic their mums. So just imagine how excited she’ll be to match her shoes to yours – and really why wouldn’t you do it when they’re this squeal-worthy cute. With Vivienne Westwood for both ladies and little lasses, how more in-vogue can a girl be? Melissa Australia and the one and only Vivienne Westwood have combined their talent-filled forces to launch two superbly cute sandal styles just perfect for little girls. The Mini Melissa shoes are pint-sized versions of the Lady Dragon Love Heart shoe and Lady Dragon Bow shoe. Melissa and Westwood really turn up the volume with this revamp on the humble iconic girls jelly sandal, creating mini versions that are just as beautiful and as much fun as the adult originals pictured below! The plastic used for the sandal, along with the heart and bow detail, is incredibly soft to avoid any discomfort to growing feet. The sole and foot bed of the shoe contains extra carefully placed padding so every small step your little fashionista takes is apparently like walking on cloud nine. 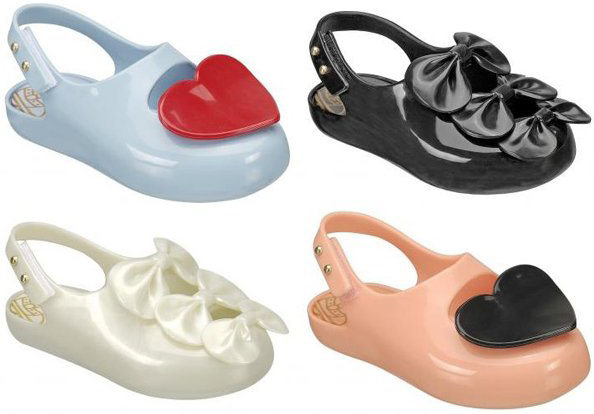 Both the Bow style and Heart style Mini Melissa shoes cost $105 per pair from Melissa Australia. Delivery is available all over Australia.